Well now you can find out exactly what happened when the boys in black and white played on 28th October. 1 year ago on 28th October 2014 – Despite Marvin Emnes given the Swans a 2nd half lead, Liverpool ran out 2-1 winners and duly knocked the Swans out of the Capital One Cup at Anfield in this 4th Round tie. Referee Keith Stroud harshly sent off Federico Fernandez in the 90th minute for serious foul play. The Swans later contested his dismissal and the decision was upheld and the red card withdrawn. 7 years ago on 28th October 2008 – Coca Cola League Championship leaders Wolverhampton Wanderers beat the Swans 2-1 at Molinuex with Darren Pratley grabbing the Swans consolation goal in front of the 21,988 crowd. 9 years ago on 28th October 2006 – Leon Britton was sent off as the Swans lost one nil at Northampton Town in Coca-Cola League One. Kenny Jackett’s Swans had been looking for their 4th consecutive win in the league and were playing against a side who had yet to win at home in the 2006/2007 season. 15 years ago on 28th October 2000 – A record breaking game for all the wrong reasons as John Hollins lost his 3rd consecutive league game as a boss for the first time, as the Swans lost 1 nil at the Vetch Field to Port Vale in Nationwide Football League Division Two. The 3,715 Vetch Field faithful also witnessed Port Vale’s first away win in over 11 months! 20 years ago on 28th October 1995 – Frank Lampard gave away a penalty – and subsequent only goal of the game – as the Swans lost 1-0 at Wrexham in Endsleigh Insurance League Two. 26 years ago on 28th October 1989 – A solitary Robbie James goal gave the Swans a 1-0 win at Walsall in Barclays League Division Three as Roger Freestone kept a clean sheet for the third time in seven games. 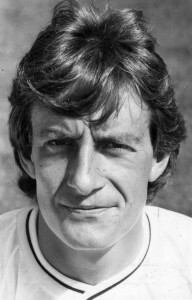 34 years ago on 28th October 1981 – Goals from Leighton James (p), Colin Irwin and Alan Curtis earned the Swans a 3-2 win after extra-time at the Vetch Field against Barnsley in the Football League Cup 2nd Round 2nd leg. A crowd of 9,897 witnessed a thriller of a game but the Swans were unable to overturn the 2-0 deficit from the 1st leg and were eliminated from the competition against their lower league opponents. 37 years ago on 28th October 1978 – The Swans hammered Peterborough United 4-1 at the Vetch Field in the Football League Third Division, as the 11,302 present enjoyed goals from Alan Waddle (2), Jeremy Charles and player-manager John Toshack. 43 years ago on 28th October 1972 – The Swans lost 2-0 at Oldham Athletic in the Football League Third Division and sunk to bottom of the table.